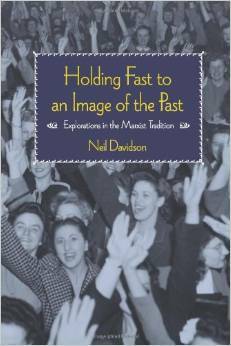 This is the first of two books to be published by Haymarket bringing together a number of Neil Davidson’s longer articles. The second volume will contain pieces on nations, states and revolution, this first volume collects everything else: a note on Marx and Engels on the Highland clearances, a political reckoning with Deutscher’s Trotsky, careful engagements with Eric Hobsbawm, Walter Benjmain and Benedict Anderson, a study of the uses of Antonio Gramsci in Scotland. Davidson has even included (I should acknowledge) a friendly review of an book I once published on the Anti-Nazi League. The richest essays are three intellectual biographies of Scottish radicals – Adam Smith, Tom Nairn and Alasdair Macintyre. Adam Smith was frequently cited in the recent referendum; not least by Alex Salmond, who used Smith’s Scottishness as a way of deflecting criticism from the Yes campaign’s economic programme. How dare they tell the people of Adam Smith’s country, he would ask rhetorically, that they do not know how to run an economy? Here, not for the first time, Smith was being cited rather than read. With his chapter on Smith, Davidson has no grander purpose than to remind Marxists that this intellectual mascot of the neo-liberal right was in fact a rather more interesting and sympathetic figure than today’s Smithians. Smith held that the labor necessary to produce a commodity was also the objective measure of its value; and his commitment to this theory has put him at odds with the mainstream of market economics for at least the last century. His vision was of a market of an artisanal society of owner-managed enterprises, located in the communities where owners resided, sharing in the community’s values and with a personal stake in the future. He was championed by Robert Burns, and taken up by an early generation of socialist economists beginning with William Spence. Tom Nairn’s name played less of a part in the referendum, although a Scotsman piece described him weeks before the vote as one of Scotland’s greatest thinkers. Nairn is best known for a series of articles in New Left Review, at first dismissing nationalism as an archaic nonsense, before seeking to combine Marxism with sympathy for Scottish nationalism, before shifting again to placing nations above class or its theories. Davidson has little time for contemporary Nairnism, which he dismisses as a vision “for the endless subdivision of the world into competing nation-states”. But as so often it is the journey which interests more than the destination. Davidson coms through lesser known Nairn pieces: for example, an article in NLR in 1974, in which Nairn (in historical mood) asked why it was that Scotland had played no part in the nationalist movements of the late nineteenth century, a question he answered on the basis of the terms of the Act of Union, which had preserved for Scotland a role as an exploiter state. Davidson analyses, with care but with less warmth Nairn’s subsquent adoption of programmatic nationalism, a trend which he analyses as a product of declining faith in working-class rebellion from about 1975 onwards. Finally, the chapter on Alasdair Macintyre is an extended and substantially rewritten version of the biography of the philosopher which appears at the start of Davidson and Paul Blackledge’s book on Macintyre’s Engagement with Marxism. Among the many insights developed in the piece, Davidson shifts Macintyre’s contribution a few years earlier from the essays which were at the heart of his and Blackledge’s book – relocating Macintyre’s greatness from the period of his collaboration with Tony Cliff and Mike Kidron (congenial though that must be to socialists raised in the IS or SWP) to the pieces belonging to the period of Macintyre’s time in the New Left and his membership of and break with Gerry Healy’s SLL. Davidson makes the case in particular for Macintyre’s essay ‘Breaking the Chains of Reason’, and for three insights to be found in it. First, Macintyre’s defence of Marxism against the criticism that it was historicist – assuming, in circular fashion, the outcome of history and then guiding action towards goals that were already assumed to be correct. Nonsense, Macintyre argued, Marx’s theories were always contingent, and assumed nothing, the world he imagined was one poised rather between (activist inspired) revolution or reform and catastrophe. Second, the piece contains a defence of the method of treating groups of people (classes) as historical agents rather than reducing all actions to the motives of individuals. Third, Davidson notes, Macintyre developed a theory of moral agency which neither prioritised means nor ends, but so both as bound together. This made it a more compelling way of thinking than the theorists of the Labour right with which than he was engaging, but also Macintyre’s fellow activists in the New Left, for the majority of whom a methodological anti-Communism could be founded on an intense belief in morality from which a sense of history had too often been lost. Having recently reread some of Peter Sedgwick’s papers, it is striking how quickly so many of the former Communists reverted (in private as in public) to a language of morality which had lost a Marxist grounding. And at a time when the left (for our own reasons) is still relearning a praxis of integrity, it is pleasant to be reminded of its best grounding.